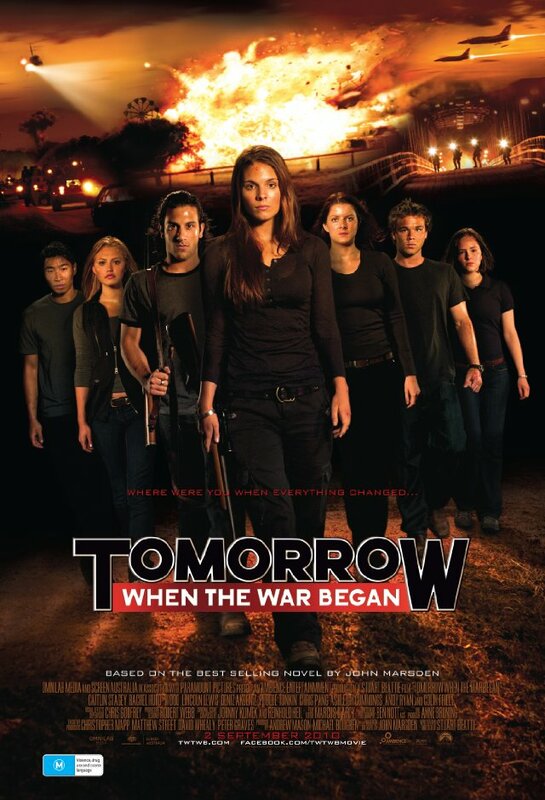 Originally released in 2010, Tomorrow When the War Began becomes available on DVD and BluRay this week. In Australia the flick made many millions. No surprise. The film adapts the first of a vastly popular book series there by John Marsden. I haven't read the books. Now I want to. Very much. Many the rough synopsis of the story gives a wrong impression. Seven teenagers come back from a weekend trip to find their homeland invaded, their parents prisoners of a foreign power, and all seven decide to fight back. Sounds like Red Dawn, doesn't it? Actually, its more like Harry Potter. Sans anything like magic. A group of young people end up in exactly the right place at the wrong time to make a difference--and do it, making heart-rending decisions in the process. What could have ended up little more than a video game (Woo-hoo! Lets Kill Us Some Foreigners!) instead becomes a war drama coupled with a terrible coming of age. Some one in the audience when I saw it went on about how if she had to kill someone in war it wouldn't bother her at all. My companion, who served in the Isreali military and knows plenty of war veterans, disagreed. So did I, not least because of memories involving my own father's nightmares from the second World War. 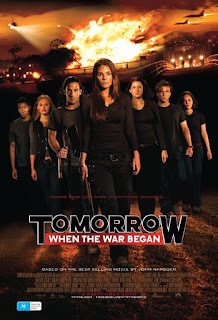 TWTWB fails--gloriously--to romanticize war even a little bit. When the central character, Ellie (Caitlin Stasey), kills to save herself and her friends in a real way she never gets over it. "I've got blood on my hands," she tells the others. Not that she's weak. On the contrary! Ellie rapidly becomes the leader of this little band, in part because she has the courage to not only fight, but also live with the horror of slaughtering human beings. Also, keep in mind this film avoids anything jingoistic. The invaders, a Coalition of Nations, remain unspecific (save that they're Asian). More, while warfare never becomes somehow wonderful, the extreme conditions don't lead to the extreme opposite conditions--nothing akin to Lord of the Flies. Instead, we watch the reluctant birth of heroes--not bloodthirsty children or mindless killing machines, but warriors who carry a heavy burden but do so well. Ellie and her best friend Corrie (Rachel Hurd Wood) with Corrie's boyfriend Kevin (Lincoln Lewis) all want to get away for a weekend, out camping in the wilderness. Joining them are Ellie's next door neighbor Homer (Deniz Akdeniz), along with perpetually chirpy Fi (Phoebe Tonkin), deeply religious Robyn (Ashleigh Cummings) and Lee (Chris Pang), the boy Ellie crushes on. In a somewhat heavy-handed bit of symbolism/foreboding the area they head for carries the name Hell. Once there, they all enjoy themselves immensely. They hardly even notice the low flying jet planes one night. Until they get back home. At that point every single character starts a wrenching personal journey. Every single one ends up forced to look into the mirror of events. Some like what they find. Others are appalled. But that inner struggle remains the heart of the film--not the (three, not terribly grand) battle sequences. Someone must mature, very quickly. Someone else must find their courage. Another struggles with the most deeply held convictions, forced to make the most horrible of choices. The dialogue's a bit clunky. One can tell at times this was a full-length book, whittled down to its essence (more shades of Harry Potter). For American tastes it may seem to start slow. But I left the theater hoping very very much for a sequel. I know there are several books. Sometimes I edit. One problem pops up again and again--a problem that drives me a little bit mad. The Passive Voice. My advice about the passive voice comes out easy to understand--don't use it. Please. For the sake of all readers everywhere, break this appalling habit. One sentence in the passive voice makes for a single drop of genuine dullness. A second sentence, especially right on top of the first, does not translate into a second drop. No, the effect grows. Two sentences using the passive voice might as well be a shot-glass full of boredom. Add a third and you're looking at a wine bottle's worth. One solid page of the passive voice translates into an Olympic-sized swimming pool of mind-numbing. First, an explanation. The Passive Voice is a mode of writing that presumes the subject of a sentence is acted upon rather than doing something. Remember the three parts of the sentence? You should. Teachers spent twelve years of your life telling you: Subject, Verb and Object. Look at this sentence: Cynthia kissed Nancy. Cynthia is doing something, so she's the subject. Kissing describes what she's doing, the verb. Nancy is the object of that action. My example sentence--Cynthia kissed Nancy--I wrote in the Active Voice. Behold the same idea in the Passive: Nancy was kissed by Cynthia. George followed Annette. Annette was followed by George. Captain Evil found the map. The map was found by Captain Evil. Elliott poisoned Anne, his wife. Anne, Elliott's wife,ended up poisoned by him. Owen achieved the rank of Grand Master. Owen was given the rank of Grand Master. Sir Olaf landed in the giant's hand. Sir Olaf was caught by the giant. Some types of wasp hunt certain spiders. Certain spiders become the prey of some types of wasp. Renee Smith climbed the summit of Apex Mountain. Renee Smith was the one who climbed the summit of Apex Mountain. Cyan marks the passive voice sentences. Look at the difference. Individually they barely disrupt anything. Put them all together and reading it feels like driving a car without releasing the park brake. Most of us learn to use the passive voice by example. Read any inter-office memo. Better than ninety-nine times out of a hundred the writer uses the passive voice throughout. History books, newspaper articles, most editorials, etc. all avoid the active voice like the plague. One understands why. Passive voice seems simpler, even technically more accurate. More insidiously, in many a documentary or public speech as well as film or t.v. show actors or professional speakers make the passive voice sound interesting. Always a trap, that--because we don't read in someone else's voice, most especially not in a voice that already knows the material and can use verbal skills to make to sound interesting. On the written page, the passive voice drones on and on, rendering virtually any subject dull. Personally, I urge most writers as an exercise to avoid it altogether--make the effort to expunge any passive voice without exception. Not because the passive voice is never appropriate, but because its overuse pervades so much writing. A simple rule of thumb to aid in this sounds odd, but works: Try to avoid the verb "to be." Not all sentences using that verb end up in the passive voice. But here's a brutal truth--hardly any passive voice sentences lack it. I firmly believe in breaking bad habits, in life and in art. The passive voice makes most writing so inherently flat it qualifies as one of the worst (and commonplace) habits among writers today. Possibly ever. Do your readers a favor. For those of you who might not know, The Woman in Black by Susan Hill has been something of a modern haunted house classic since its publication in 1983. A new film version opened recently. Starring Daniel Radcliffe, it chronicles the tale of a young solicitor sent to settle the estate of a reclusive widow in the Edwardian Era (just prior to the first World War). Most haunted house stories work because the creators explore what seem like a simple, yet disturbing premise--that the past doesn't die. Past tragedies continue to echo. Shadows of sins from our parents' time and their parents before them reach out and mar the sunlit days of the present. The Woman in Black provides a vivid example of exactly that. As Arthur Kipps (the solicitor in question) uncovers a heart-rending tale going through the papers of Mrs. Alice Drablow, who lost her only son Nathaniel in a carriage accident on the local marsh so many years ago. Things, of course, prove not quite as they initially seem. Nathaniel had in fact been the son of Mrs. Drablow's sister. Now, in rage over her loss, that sister prowls the house and village. To see her, the Woman in Black, always presages the death of a child. Little wonder the town where Kipps arrives seems awash in grief and terror! All of which the filmmakers convey very well indeed! The book, as per its medium, takes its time and can afford far more subtlety. Films, after all, come rushing at you 25 frames per second for two hours! One can admire the way the viewer remains at the edge of one's seat, often by the simple (but profoundly workable) trick of setting up shots of one character as if a second character should be present. Sometimes, that second character even appears. Likewise the film uses the generally creepy quality of dolls to great effect. Mind you, none of that works very well without good actors bringing to life characters before our eyes. Radcliffe, best known of course as Harry Potter (although he also played Rudyard Kipling's son in My Boy Jack as well as Alan Strang in Equus, etc. ), really shows his acting chops here. I'm a huge Potter fan yet never once did it seem like I was viewing the boy wizard. Really, so many things came through in that young man's eyes--including a bone-deep despair kept at bay with only a resolution of steel (and that, barely). No less impressive, albeit in a subtler way, were the rest of the cast. But returning to the script--some of the changes made clearly intend to focus and telescope action. In the novel Arthur begins the story single, then later weds and has a child. For the film, he becomes a widower with a beloved four-year-old son, on the verge of losing his position. All this throws things nicely into sharp relief. Personally, I found less interesting the switch from hearing the fatal carriage accident from the past in the open where he can see absolutely nothing all the way to the horizon to a dense bank of fog. That seemed a tad much. But only personally. Still worked. The end, however, ultimately seems like it pulls its dramatic punch. Somewhat. It feels out-of-place for two Edwardian gentlemen to come up with the solution they did--find young Nathaniel's body and put it in his real mother's grave so they can be together. Certainly that might occur to me, or anyone with an exposure to recent notions of spirituality. And true, the film goes out of its way to point out (quite logically) that both Arthur and his new-found friend in the small village (played superbly as ever by the great Ciaran Hinds) have at least some familiarity with the Edwardian-era Spiritualist Movement. So maybe I'm a little harsh? Maybe. Consider then the Woman in White. No, I don't mean the Wilkie Collins novel. Rather, Arthur's dead wife begins to appear as a counter-point to the film's ghostly antagonist. To Arthur alone, and then at the very end in a way that gives a weird, melancholy note of hope, even redemption amid the creeping horror. Not at all sure that made for a better story. Seems to go against the grain of the whole idea--we don't really get to escape the consequences of the past, ever. At most we can get lucky and avoid them, learn from them to counter their impact and (hopefully) not repeat the same errors. 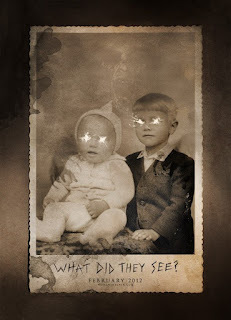 Without looking for specific allegories about current events, seems to me this is the IDEA behind most ghost stories. A valid and worthy idea, one that gets under the skin and resonates down to the bone. But the current film version of The Woman in Black, while really excellent in most respects, falls short on that. A nuance, to be sure, but an important one. Which means the film ultimately remains quite good. Fun and scary and well-done, but the ending doesn't quite measure up to what goes before. As a result, that final shot lacks the real impact the filmmakers seemed to be aiming for.